There's a separate table - base_order_shipments - that has ALL the shipment info. I'd like to add a column that shows ALL shipments for the same days within the date range. These would be orders, or partial orders that were NOT able to be shipped the day they were received, and I would expect the shipments from the outer join to be within those numbers as well - no need to exclude them). So generally the total shipments for any given day should be higher than the orders received and shipped on the same given day. I know this is going to be a subquery and that I have to join the grouped results of the inner join to the outer join, but I just cannot work out how to do it with my tables. Any enlightenment will be greatly appreciated! Thanks for reading! there were two days where no shipments were made at all, 12-2 and 12-9, how can i get the orders received on those two days to appear, even though there were 0 shipments at all on those days... the having clause is what i tried, but the results are the same either way as pictured. 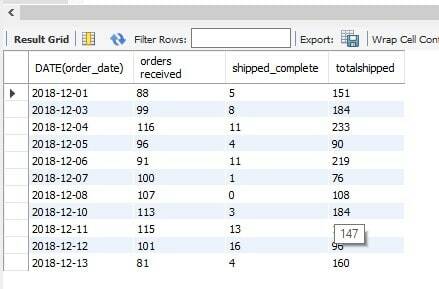 If I do the subquery backwards (i.e subquery base_orders as opposed to order shipments) from the way it is below, I get all shipments for the entire period on the received and the total shipped row - I did try that. Again, any help would greatly appreciated! thanks in advance! That join base_order_shipments bos on date(bos.completed) = date(bo.completed) criteria will produce Cartesian product of all records with the same date. You should join on the related id fields of those tables. Do you have something like base_order_shipments.base_order_id ? Yes, there absolutely is... and it is the base_order_id. I was thinking I'd run into trouble because if there is no shipment there's no base_order_id entry in the table, but that is essentially the same problem I caused for myself using the date! Thank you again. I didn't put this in the original question you helped me out with before, because I didn't want to take advantage of your kindness. I'm sure this is it, and will try it a bit later. Thank you again. If I remove the comment indicator before the "and" in the JOIN I still get the same results. Maybe I misunderstand your goal, but I don't get the reason to involve the 2nd table. Alternatively since MySQL 8.0.1 you can use CTE. The second table, base_order_shipments shows ALL shipments for each day, not just those that were received and Fully shipped on that same given day. For example, if an order was received outside of the range, and was unable to be shipped because the merch was out of stock... it could be shipped within that date range because the stock came in. The order would be in the base_orders table, but the created would be outside of that defined range. Also, it might take multiple shipments for the order/shipments to be complete, and it doesn't show the number of shipments that were required to make the order shipped in full. So I have to bump it all up against the other table that shows ALL shipments for the day. That table doesn't really have info about an order being complete, just shipments being complete, if you get the distinction. I don't need to split the first two columns out of that last column though, I would expect them to be in the total. The results from this post (17 Dec 18 21:43)are the closest, the only problem there is it's just missing days where there were ZERO shipments at all - no orders that were created that day were shipped, nor were any orders created outside of the range shipped. so from the results from that post - On 12/1 88 orders were received dated 12/1. Only 5 of those orders were shipped complete, but there were 146 orders that were created outside of the 12/1 - 12/13 range that shipped. It's really a shipment report as opposed to an order report.